Until the fateful day that changed his life forever. He was working as a junior surgeon at the Saddam Hussein Medical Centre in Baghdad when busloads of army deserters were hauled into the hospital by a team of heavily armed soldiers. To their horror, the surgeons were ordered to amputate the tops of the deserters’ ears, by order of Saddam Hussein. Muderis shared the view of this brave senior doctor, but he didn’t want to die. He slipped out of the theatre unobserved, hid in the women’s toilets for five hours, and then fled. He had no plan, only an instinct to escape Iraq before the authorities caught up with him. With a combination of luck, loyal friends, and bribery using his mother’s money he made his way to Jordan, and from there to Malaysia where he hoped to be able to get work as a doctor. It was in Kuala Lumpur that he found himself using his fluency in English to help a couple of refugees who were taking the people-smuggling route to Australia, and through a complex web of circumstances he ended up joining them on the boat to Christmas Island. From there he was sent to the notorious Curtin Detention Centre in the remote Western Australian desert, a place deliberately designed to dehumanise the internees. There he was always addressed by his assigned number 942, arbitrarily punished with solitary confinement and repeatedly told to go back to where he came from. In 2000 after 10 months he was granted refugee status and finally freed. And despite the way Australia treated him, Muderis has remained here and forged a new life, becoming one of the world’s top osseointegration surgeons. It is extraordinary to think that if he had buckled under the stress and trauma of Curtin, this brilliant man might never have pioneered the techniques that have changed the lives of amputees. Muderis bookends his book with the story of Michael Swain, a British soldier who lost both his legs in Afghanistan. Thanks to Muderis, he was able to walk unaided at his investiture to receive an MBE from the Queen. 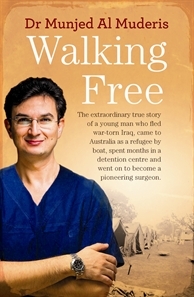 This is a compelling story, recounting details of life in Iraq that go beyond the headlines and revealing aspects of internment in Australia that more people should know about. Patrick Weaver, the journalist who worked with Muderis on this memoir, has done an excellent job of bringing a powerful story to life. Also see this review at the SMH. Source: Review copy courtesy of Allen and Unwin. Excellent review of this account of the life of a determined and brave man in a vile situation. Yet again you make me want to read it now – err except my TBR mountains are now falling over. On my wish list though. A reader I met when last in Australia is recommending the Adelaide Literary Festival to me……. Ah yes indeed, Carol, the Adelaide LitFest is on my bucket list too. I’ve never been able to go because of school, but with retirement not far away now all kinds of opportunities beckon. That sounds so good, Lisa! I don’t read much non-fiction, but I’m going to put this one on my list. Thanks for bringing it to our attention. Well, you know me, I’m not one for sad memoirs, but this book is so well-written and the story so compelling, I couldn’t put it down. Your enthusiasm came through in your review. That is largely what decided me. This sounds like a ‘must read’ for every Australian. Yes indeed – and for a couple of politicians especially! Well, I finally got around to reading this book – it only took me 3 years 😄. I particularly liked the early section where he outlines his experiences in Iraq during the conflicts. Hard to come to terms with the brutality of the detention camps – we call ourselves the lucky country 😑. Well worth reading – thanks for bringing it to my attention. Thanks for this, Lisa. Sounds like my sort of book and seems to be available in UK (on kindle anyway) so have added it to my 10-page long (!!!) wishlist. LOL at least with a kindle you haven’t got the books staring accusingly at you!